Perfect for the travelling executive, or couple / single visiting the beautiful Manning Valley is this fresh and newly renovated apartment in our beautiful 90 year old Federation home. The space comprises a brand new fully equipped kitchen with full size stove/oven, fridge, microwave, and includes reverse cycle air conditioner, PLUS beautiful slow combustion heater for those chilly winter nights. There is a modern full size bathroom with deep bathtub and shower, plus a new front loader washing machine. The bedroom has a queen bed, lots of wardrobe space, and there is also a study situated just off the main bedroom. The property is within a short walk of the beautiful Manning River, Taree CBD, and Manning Base Hospital. We have NBN wifi that is free for our guests to use. We live onsite, and the apartment is basically the front half of our home - totally renovated and fully self-contained. You have your own private entry, and are fully independent of us. If you are travelling with a baby, we also have a porta-cot if you need one - but please let us know in advance. We moved to the beautiful Manning Valley in 1996, choosing the region to establish a photography business in and raise our young family. 20+ years on, and we are empty-nesters with home-based businesses that keep us both busy. Ingrid runs her own Virtual Assistant business, as well as helping to get new VAs established. Karl still dabbles in photography, but these days he bakes beautiful artisan sourdough bread 2 days per week at a local German smallgoods outlet. A keen fisherman, Karl is often out on the water securing the 'catch of the day'! Our home was a great size for us and our growing family, however, since they left home some years ago, we found ourselves literally "rattling" around our large home, and it occurred to us that with a few changes (including adding a new kitchen into the front room), we could make it a fully self-contained apartment-style space for guests who wanted to visit our beautiful area. We love the Federation-style home that we live in, and we hope our guests do too. With lovely architraves, high ceilings, and larger rooms, we think it's a little better than the average accommodation! 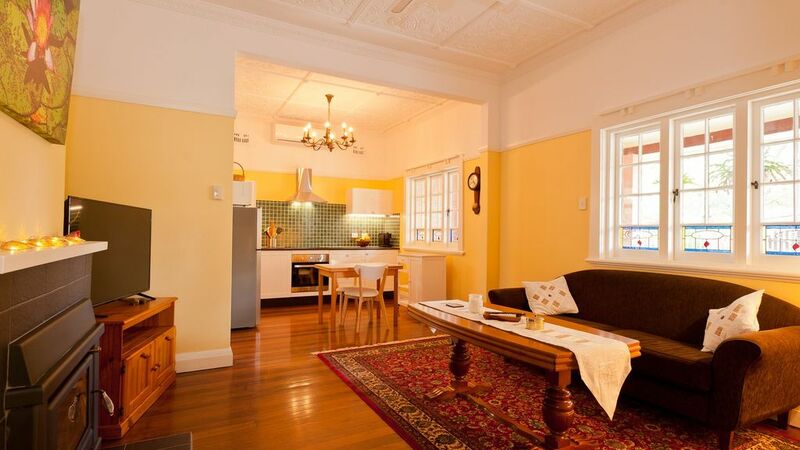 Located in a quiet and leafy residential street within 15 mins walk of the CBD of Taree. All the comforts of home and loads of goodies for us.. The apartment was beautifully appointed for our enjoyment. Many thanks John and Jennie. Spotlessly clean, beautifully appointed, close to town. Hosts left lights on, fans and air con going (it was extremely hot the day I arrived) and texted to ensure all was well. Pet friendly. Very reasonably priced as well. Only comment is there's not much yard for a pet but if your pet is house trained and well behaved (mine is) it really isn't an issue. Would definitely stay there again. We thoroughly enjoyed our stay in this charming property. The apartment is very spacious and renovated to a high standard, keeping old details like timber floors and beautiful windows that gives the property character. You find all the comforts in this well-kept, clean and fresh property - full scale kitchen, split A/C, TV, bathtub, comfortable bed and then some. We were so pleased that a wonderful property like this is also pet friendly! The property is located only a few minutes walk from the centre of Taree with shops, cafes and restaurants. It's also close to the river shore, which provides a beautiful setting for a walk, whether you need to walk a dog or not. The breakfast supply provided by the lovely hosts deserves an extra mention. Such a wonderful surprise to find generous breakfast supplies like fresh eggs, various spreads, yoghurt and milk, toast in the freezer to keep fresh and a whole range of cereals, on addition to tea, coffee and hot chocolate. We really enjoyed our stay and time permitting, would've stayed longer. Thank you Ingrid for a lovely stay! We are so pleased you enjoyed your stay with us, and thank you for your lovely comments! Hope you can visit again some time soon. Beautifully clean, well equipped and homely. Appreciated the welcoming environment including for our dogs. Lots of space, perfect for a stop over as well as a longer stay.